Hamilton County Mayor Jim Coppinger listens during the meeting. 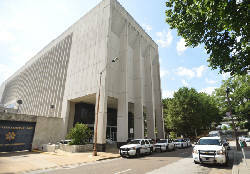 The Hamilton County Commission listened to a presentation and recommendations for short and long-term jail and workhouse overcrowding at the Wednesday meeting in the Hamilton County Courthouse on August 29, 2017. 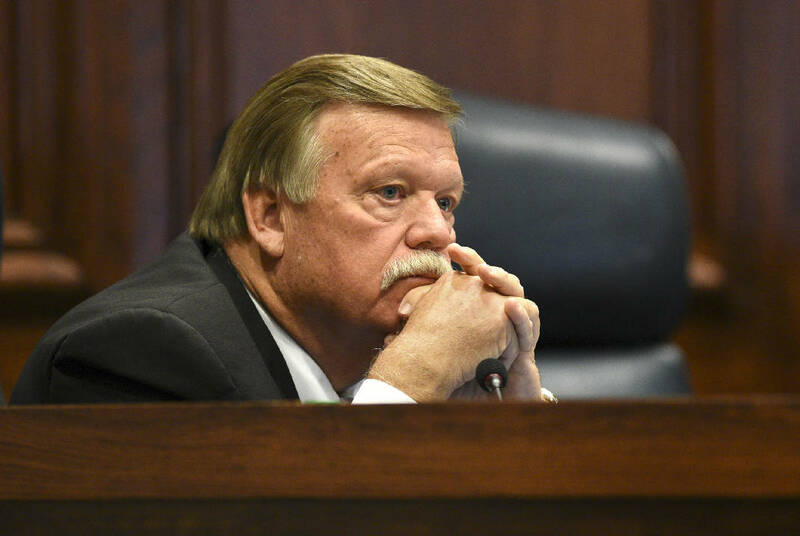 Many Hamilton County commissioners said they have not decided if they will vote for Mayor Jim Coppinger's plan to raise tax revenues to pay for school, sewer and jail upgrades, but they have decided who will lead them for the next 12 months. On Wednesday, they picked Randy Fairbanks and Sabrena Smedley as their chairman and vice chairwoman, respectively. The two will assume their new duties on Wednesday. Commissioners mostly stayed quiet on the mayor's plan to bring in an extra $25.5 million resulting from the recent countywide reappraisal, which saw average home and business property values go up by nearly 10 percent. The extra revenue will fuel borrowing power for $180 million in capital spending, according to Coppinger's proposal. The law requires the commission to adopt the state-certified rate of $2.4976 per $100 of assessed value to keep the county's overall revenue level the same; counties cannot simply rake in more cash because property values go up after a reappraisal. Coppinger, however, wants the county commission to immediately reset the property tax rate to $2.7652 per $100 of assessed value — exactly where it sits today. In short, if a property's value increased, its owner will get a larger tax bill. While Commissioner Joe Graham said he did not consider the measure a tax increase because it simply kept the same property tax rate in place, Commissioner Tim Boyd begged to differ. "This is, in effect, a tax increase," Boyd said, a position confirmed by county finance officials. Boyd chafed over being the only commissioner who did not speak with Coppinger about the plan beforehand, but Coppinger responded by saying Boyd is often difficult to reach and has the same responsibility and opportunity to contact the mayor's office as any other commissioner. When Coppinger announced the tax rate reset on Tuesday, he said he believed he had enough commission votes to pass it. "I've had individual discussions with each commissioner," Coppinger said at the time. "There's nine commissioners and in all nine districts there's needs." Commissioners also reviewed a couple of property tax discount programs for seniors and disabled citizens. After the meeting, some commissioners offered cautious comments. "I'm still contemplating it," Commission Chairman Chester Bankston said. 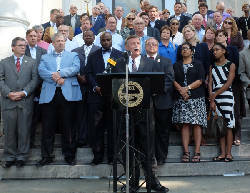 Bankston, like Graham and Commissioner Warren Mackey, stood behind the mayor when he announced his plan on the courthouse steps Tuesday. Graham, Mackey and Commission Vice Chairman Greg Beck have all said they would support the tax rate reset. "I think it's a good plan, a needed plan," Fairbanks said, adding he would not make a decision until the commission has held a public meeting on the matter on Sept. 6. "I'm not completely there yet. I've got to have some more information." Smedley, hoarse from illness, said she felt much the same way as Fairbanks and wanted to discuss the issue more with her constituents. "There's no doubt there's significant needs across the county," she said. "I mean, we've not had an increase in taxes in 10 or 12 years. That's a no-brainer. You know there's needs." Smedley said she wants to consider whether the county should adopt any tax relief policies for the elderly. Commissioner Greg Martin said he would listen to his constituents as well, while Commissioner Jim Fields said he had no comment. Commission Chairman-elect Fairbanks, nominated by Smedley, defeated nominees Bankston, who has been chairman for the last two years, and Fields, who will not seek re-election. Martin nominated Fields, who received three votes; Bankston, who nominated himself, received none. Fairbanks initially fell short of the five votes needed to win because commissioners Boyd and Mackey passed. However, the pair subsequently gave their votes to him, giving Fairbanks a total of six. Graham joined with Martin and Fields. "I have enjoyed the past two years as a leader and I hope I've done a good job," Bankston said. "I've done my best." Commission Vice Chairwoman-elect Smedley, nominated for by Bankston, took a 7-2 win over Graham, who received the support of Fields. Smedley replaces Beck, who took the post from Fairbanks in December. Fairbanks, elected to the spot in September 2015, held the post by default when he and Beck tied for vice chairman votes last September. "You had a phenomenal time, I believe, with the issues that have come up," Beck said, praising Bankston's leadership and kindness.